Congratulations to the winners of the 2018 Coolangatta Gold Ali Day and Georgia Miller! Sydney’s Northcliffe newcomer and former swim star Georgia Miller claimed her maiden Coolangatta Gold title. 21-year-old Miller also recorded a stunning time of 4:29.22 to beat team mate Danielle McKenzie (4:39.08) and Noosa’s Australian champion Lana Rogers third in 4:41.42. Well done to all competitors, organisers and volunteers on yet another successful Coollie Gold at our stunning Gold Coast! Sold Out Events was very proud to once again support Surf Life Saving Australia with a range of logistics, operations and production services for the delivery of this iconic and epic event that is also one of the longest running events of our company. It was the 14th edition of the Coolangatta Gold and we are proud to have been associated with this event through our partnership with Surf Life Saving Australia – a partnership that dates back 25 years. From signage and course set up to staffing, transport and sponsor activations, Sold Out Events has helped shape and grow this iconic Australian event. Bring on the Coolie Gold 2019! 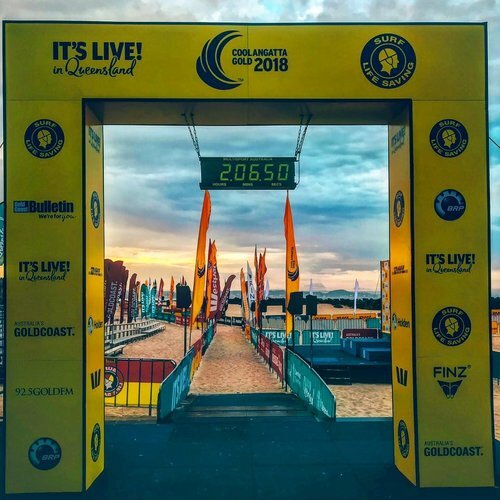 The Coolangatta Gold is one of the premier sporting events on the Australian Surf Life Saving calendar and is a gruelling marathon that combines multiple surf lifesaving disciplines: ski, swim, board and run. It’s cemented its place as one of the most challenging endurance sports in the world. Competitors set out from Coolangatta Beach in the long-course event and paddle a surf ski 23 kilometres to Miami Beach before making the return trip via running, swimming and board paddling. Fun Fact: The Coolangatta Gold race concept actually began as a central theme for a motion picture more than 30 years ago.